With legal title to their lands, Miskitu organizations now have more leverage in pursuing restitution and repatriation. At the same time, it is equally possible that the new land rights will make no difference at all to traffickers. This article originally appeared in the Winter 2013 issue "Latino New York"
A landing strip used by traffickers near a native community, 2011. Photo by K. McSweeney. At last, there is good news from Honduras. Well, maybe. In September, the government of President Porfirio Lobo granted Miskitu people formal ownership over almost 3,000 square miles of their ancestral territory in the northeastern region known as La Mosquitia. This appears to be a vital victory in indigenous Hondurans’ struggle for territorial autonomy. But it can also be read as a deeply cynical gesture by a government that, facing an upcoming election, was keen to distract attention from its otherwise appalling record on native rights and its avaricious approach to indigenous lands and resources. In just the past few months, the Honduran army has shot dead an indigenous Lenca leader protesting the construction of the Agua Zarca hydroelectric dam, and has imprisoned indigenous leader Berta Cáceres for her support of the protests. A few days after the killing, the “Law for the Promotion of Development and Reconversion of the Public Debt” was passed, which authorizes the administration to leverage the country’s “idle” resources as collateral to woo investment in resource extraction and agroindustry. Then, in mid-August, the administration issued a decree that allows the military to sell timber—legitimizing and incentivizing the longstanding practice of illegal military enrichment from indigenous forests. These new laws join a body of others (including the Investment Promotion and Protection Act, the Public-Private Partnership Promotion Act, the unconstitutional Model Cities law, and more) passed since President Porfirio “Pepe” Lobo took power in the rushed election that followed the 2009 coup. All are aimed at privatizing Honduras’ water, land, minerals, and hydrocarbons. Many of these resources lie within indigenous territories, particularly in La Mosquitia—homeland to Miskitu, Tawahka, Pech, and Garífuna peoples. Lobo’s administration is quite open about its designs on this land- and resource-rich area. The 2010 “National Program for Investment Promotion” (later promoted as “Honduras is Open for Business”) for example, zones the Mosquitia for direct foreign investment in agribusiness, forestry, and energy. Already, construction of the Patuca III hydroelectric dam—which will have an adverse impact on thousands of downriver Miskitu and Tawahka residents—is well underway. Talks with British Gas Group over oil exploration in the Mosquitia have also begun. After all, the government retains sub-surface rights to all indigenous lands—including those just titled to the Miskitu. But there is yet more reason to be deeply wary about inferring too much from this epic land ownership transfer: drug trafficking. Honduras is now infamous for its staggering rates of drug-related violence, but links between drug trafficking and Lobo’s resource-grabbing agenda are rarely made. In fact—especially in La Mosquitia—it is narco-traffickers who act as shock troops in the assault on native homelands, ruthlessly dispossessing residents and rapaciously converting forest commons to private pasture primed for sale. And traffickers simply do not care who owns what. If they want it, it’s theirs. 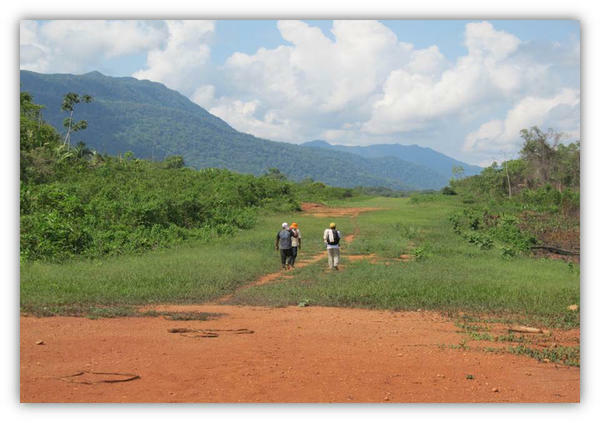 Many observers consider most of the Mosquitia—including the newly titled areas—to be effectively controlled by drug-trafficking organizations (DTOs). But the narcos are not in the land-grabbing business for themselves alone; in the Mosquitia region, they represent the thin end of the corporate wedge prying native peoples from native lands. 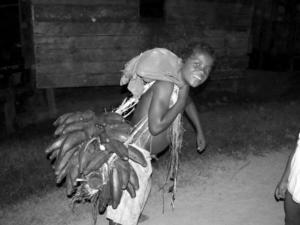 Miskitu boy carrying plantains home. Photo by S. Santiago. We have observed these dynamics first-hand. On our last visits to the region, the dynamics of narco-dispossession were impossible to ignore. Residents recounted story after story of being coerced—by money or violence—to give up their lands. In the Miskitu town of Brus Laguna (pop. 11,000), for example, few residents plant their fields any more, since most agricultural lands were bought up by a narco. If locals wish to fish in the town’s lagoon, they must get traffickers’ permission. In another community, a trafficker pressured an indigenous landowner to sell. When the landowner refused, he was killed by hitmen. His terrorized wife then sold the land at a very low price. 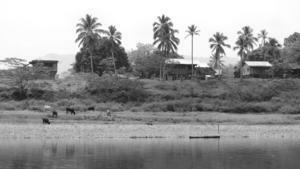 In the Río Plátano Biosphere Reserve, whole communities have abandoned their lands following threats from traffickers. These instances make clear that land titles are only as meaningful as the guns and money that back them up. Miskitu village. Photo by S. Santiago. Is it by coincidence or design that these narco-dynamics dovetail so well with the Honduran government’s pro-business goals in the Mosquitia? This is an open question. Many Hondurans, however, are quick to point out that there are rarely more than a few degrees of separation between politicians, military leaders, business elites, and traffickers.7 The most pertinent example here must surely be that of Honduran business tycoon, thug, and shadow politician Miguel Facussé. Coup plotter, he is also the uncle of a former president, and a key architect of “Honduras is Open for Business.” He runs Dinant Corporation, a vegetable oil and food conglomerate. He is aggressively expanding his African oil palm plantations into the Mosquitia and is known to be among the elites targeting indigenous lands, and using local intermediaries to brutally consolidate choice riparian lands on his behalf. Facussé is also, by many accounts, enriched by narco-enterprise. A 2004 U.S. Embassy cable released in 2011 by Wikileaks, for example, shows that a drug plane landed and was unloaded on Facussé’s property under the protection of his private security force.8 According to a Miskitu leader: “Miguel Facussé has it all mapped out! He’s using local families to corner the land market with money from the drug traffic. He wants to plant African palm! And there are other powerful people doing the same thing.” Sure enough: the U.S. Treasury just froze the assets of Honduras’ Los Cachiros trafficking organization—assets that included cattle, oil palm, and mining businesses. Now that the Miskitu own a big chunk of their territory, it is possible to imagine that they will be better equipped to fight the divide-and-conquer tactics of these narco-enabled corporate invaders. With legal title to their lands, Miskitu organizations now, presumably, have more leverage in pursuing restitution and repatriation through national and international legal mechanisms. At the same time, however, it is equally possible to imagine that the new land rights will make no difference at all to traffickers, who will continue to co-opt and terrorize residents regardless of the land tenure regime. The 2,000-strong Tawahka people, for one, seem convinced of the latter. They are proceeding with plans to relocate women, children, and the elderly into exile in northern Nicaragua, leaving only men to try to fend off the narco-colonization of their ancestral lands along Honduras’ Patuca River. Another glimmer of hope came this past August, when U.S. Senator Patrick Leahy, chair of the Appropriations Committee, suspended Plan Merida drug-war funding for Mexican and Central American militaries. This suggests a very welcome rethinking of formerly knee-jerk re-financing of failed militarization strategies in the war on drugs. Many hope that these developments signal the beginning of a sea change in how the United States confronts the damages wrought by drug trafficking in the hemisphere. Because ultimately, the fate of the Mosquitia’s people and forests is more likely to depend on Washington’s willingness to re-think its drug policy than on indigenous peoples’ land title victories—however historic those victories may be. 1. James Bosworth, “Honduras: Organized Crime Gaining Amid Political Crisis,” 2011, http://www.wilsoncenter.org/sites/default/files/Bosworth.FIN.pdf. 2. INCSR, 2013 International Narcotics Control Strategy Report. Washington, DC: Bureau of International Narcotics and Law Enforcement Affairs, 2013. 3. UNODC, Transnational organized crime in Central America and the Caribbean: a threat assessment. Vienna: United Nations Office on Drugs and Crime, 2012. 4. Douglas Farah, Central America’s Northern Triangle: a Time of Turmoil and Transition, 2013. http://www.ibiconsultants.net/_pdf/turmoil-and-transition-2.pdf; see also: Mónica Villanueva and María Idalia Gómez, “Controla narcotráfico minas en 5 estados,” 24 Horas, August 16, 2013, http://www.24-horas.mx/controla-narcotrafico-minas-en-cinco-estados/. 6. See: Alexander Main and Annie Bird, “Still Waiting for Justice: An Assessment of the Honduran Public Ministry’s Investigation of the May 11, 2012 Killings in Ahuas, Honduras,” Center for Economic and Policy Research, April 2013, http://www.cepr.net/documents/publications/honduras-ahuas-2013-04.pdf. 7. See: Julie Marie Bunck, and Michael Ross Fowler, Bribes, Bullets, and Intimidation: Drug Trafficking and the Law in Central America. University Park, PA: The Pennsylvania State University Press, 2012; Steven Dudley, “Drug trafficking organizations in Central America: Transportistas, Mexican cartels, and maras,” San Diego, CA: University of San Diego Woodrow Wilson International Center for Scholars Mexico Institute, 2010. 9. OAS, The Drug Problem in the Americas. Washington, DC: General Secretariat, Organization of American States, 2013. K. McSweeney is a geographer, and Z. Pearson is a PhD candidate in the Department of Geography at Ohio State University. An additional author has chosen to remain anonymous out of concern for the safety of colleagues in Honduras.